The West Wing: "War Crimes"/"Gone Quiet"
"War Crimes"/"Gone Quiet" / "War Crimes"/"Gone Quiet"
Donna lies in her deposition, and a submarine in North Korean waters suddenly ceases communications. Other than my computer writings at this fine journalistic establishment, I work for the Just For Laughs festival as a consultant, where I struggle constantly with not feeling good enough for the job. Like, who am I to judge people's comic ability? I'm just some guy—what does my opinion matter? When are people going to figure out that I don't know what the frak I'm talking about? I think about it a lot, even after three years with the (wonderful) organization. At one point I voiced my concerns to my boss, who said something so simple but so unbelievably profound: "Well, someone has to do this job, and in this case, that someone is you." At the end of "Gone Quiet," CJ asks Bartlet why he wants to be President. Considering a potential opponent flubbed the question big-time, she just wants her guy to be prepared. He pauses, then shrugs. "I almost had it," he says, then goes back to reading. It's in this moment, more than ever, that I see President Bartlet not as the President, but as some guy who has to do the job, and in this case, that someone is Bartlet. It's also a moment that screams, "What the hell am I doing?" To get to that moment, though, a lot has to happen, and both "War Crimes" and "Gone Quiet" are packed with treachery, backhandedness, and more than a few motivational speeches. At the same time, most episodes of The West Wing don't have much plot to speak of. Things certainly happen and stories get developed, but if the show had purely narrative intentions, I'm sure "War Crimes" and "Gone Quiet" would have flown forward. Maybe there would be a lot more military action, because everyone likes action, right? There'd be a few shots of an actual submarine on "Gone Quiet," instead of a bunch of people sitting around and talking about a submarine. At the very least, we'd get to see the helicopter blades the President posits are far too tall to hurt anyone. That's just not how The West Wing rolls. Somehow, the show has managed to make talking about something infinitely more compelling than actually seeing the thing happen. It goes against the conventional wisdom of television, or really any partially visual medium: Show; don't tell. Demonstrate; don't explain. Do the thing; don't just talk about the thing. The TV nerd in me loves that the show is toying with these conventions, but as much as The West Wing is a cerebral show that can be analyzed and discussed to death, it's also a show that manages to go for the gut in the smallest, but ultimately most powerful way. For example: When I think about these two episodes—some of the finest—I remember tiny moments executed in silence. Hoynes taking off his jacket before entering the Oval Office; the President and Charlie are joking about sports, but Hoynes looks like he's bracing himself for a punch in the face. 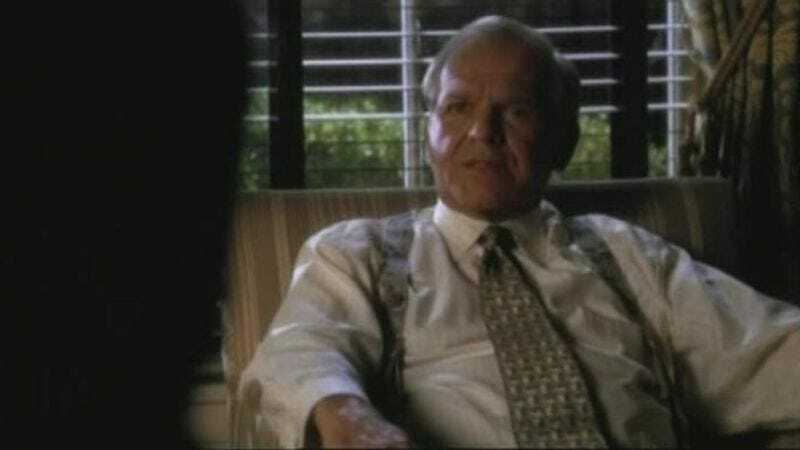 The President receiving the news that Melissa Markey, the victim of an accidental shooting, has been pronounced dead, and Bartlet freezing in place—his wife, whom he was previously arguing with, turning to look him right in the eye. Toby speechless once he learns he's being quoted saying something unflattering, and that there's a leak inside the White House team directly to the press. Donna giving her deposition and stating that she doesn't keep a diary, then her eyes widening when Clifford Calley asks that her (false) testimony be read back to her. Leo learning he bombed civilians in Vietnam, every muscle in his face ready to be on the defensive. "Do absolutely nothing," Josh barks to Donna when he learns that she lied under oath. 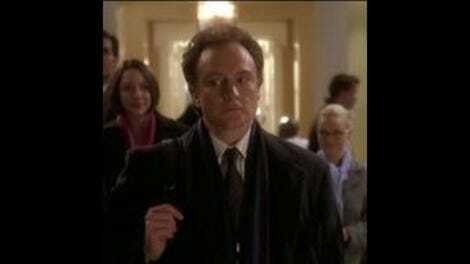 On The West Wing, there's a whole lot of awesome nothing happening. Ultimately, "War Crimes" is about mistakes characters made in the past and the modern day realization that things might not be as flawless as they'd perceived them to be in the moment. The obvious one is the fact that Leo thought he was bombing a military target, when in fact he killed 11 civilians a long time ago. "All wars are crimes," his friend the general counters, suggesting it was a lose-lose situation from the get-go. And now Leo's powerless to change his past actions; he can only sit and ponder them. He can only do nothing. The other characters fare slightly better, in that they can take a little bit of action, rather than simply wish they didn't know. Toby learns from CJ that one of his comments—that the President would only win the next election on Hoynes' coattails—has been seized by a reporter that seems to be CJ's intellectual equivalent in the way Danny was during season one. This is bad, and very little spin can salvage the situation. Toby's mistake is, in part, saying the comment in the first place, but really it's that he blindly trusted his staff to do the right thing. His heartfelt speech to everyone (and truly it's everyone, for his instructions were to gather every staffer in the mess hall in two hours, and if they can't make it, they shouldn't bother to come in tomorrow to work) was an episode high point. But to a certain extent, it's too little too late, and Toby knows that. The leak occurred; all he can do is plead with everyone that it not happen again. Then, when all that's settled, CJ goes back to the reporter with a statement and finds herself chastised for placing undue emphasis on gossip. Her mistake, it turns out, is fighting the wrong fights. Donna's case is an interesting one. She testifies that she doesn't keep a diary, which is a lie. Later, though, she tells Josh that it slipped out of her as an accident. But when she's talking to Calley, it's insinuated that she hid it on purpose because if it becomes part of the case, Calley is going to be able to read it, and presumably there's some saucy stuff about him in there that Donna doesn't want shared. So I guess she inadvertently lied, but the lie came from a place that's defensive about her relationship with Calley. It's kind of a brilliant blending of professional obligation and trying to save face on a personal level, and I felt my allegiances tearing as it played out. It's a situation that has come up a lot on The West Wing, but Janel Moloney knocks this scene out of the park. Not surprisingly, this was the second episode submitted, along with "On The Day Before," when she was nominated for an Emmy, and it's clear she made the right choice. But I want to give major props to Moloney for her work up until those episodes. Even when Donna was merely chatting with Josh or fumbling around the White House, I always got the sense there was something else brewing below the surface. Donna's one of the smartest characters on the show, and she sees the bigger picture quicker than her cohorts, bogged down by details and allegiances. There was a sharpness to the way she walked and talked (I guess the standard for every West Wing character should be how they walk and talk) that betrayed just how on-point and emotionally invested she was going to be with this whole subpoena thing. Even the way she laughs at Josh and CJ—spewing meaningless hyperbole about why Bartlet wants to be President—simultaneously shuts them down and establishes herself as the smartest one in the room. And that's just a laugh. As enjoyable as those small moments are, I liked how "War Crimes" tempered them with a knock down, drag out fight between Bartlet and Hoynes. One's pissed at Hoynes for tipping people off to Bartlet's MS long before it was announced; the other's pissed at Bartlet for lying in the first place, especially since it meant betraying what little personal relationship the two shared. Hoynes, like Bruno in "Gone Quiet," sees the current administration as stubborn, unable to admit its own faults for the sake of moving forward—and when it comes to Bruno, to win elections. Bartlet wants to win despite his wrongdoings; Hoynes and Bruno want Bartlet to win in spite of them. As long as we're talking about "Gone Quiet" now, take Bruno's speech near the end of the episode. He swiftly takes down Republican double-talk and Democratic laziness in one fell swoop. But I don't think Bartlet is really going to do anything along the lines of what Bruno's suggesting, at least not because he's suggesting it. What I took away from "Gone Quiet" is that there's a benefit to doing nothing and letting things shake out naturally. It's a lesson that takes time to sink in: At first, when the President learns a submarine in North Korean waters has "gone quiet" (stopped communicating with its American base), he's ready to rush in and rescue it, despite the common sense explanation that the sub's probably avoiding detection. The other stories involve similarly hot-headed people cooling over the course of the episode. CJ's thrilled that a potential Bartlet opponent made a fool of himself in the press. Abigail resists the implication that she committed a crime in the care of her husband. Toby fights with a woman from the appropriations committee who's eager to defund the arts endowment in favor of parks security. Sam is annoyed at Bruno's advice to run a pro-Bartlet ad in the sneakiest way possible—not mentioning that he's running for President, so therefore he can use soft money to pay for the thing. Later, everyone's satisfied with how things shook out (though CJ needs the newly patient President to cool her jets). Of course, there's a difference between sitting back calmly and watching your pawns coming into view just as you imagined they would and spinning the wheels of anxiety because you don't know what else to do. One's confident; the other's floundering. The Bartlet administration is decisive, but I rarely get the sense that they're completely sure of whatever it is they're doing. When Bruno rails against passive Democrats, for example, Toby just sits there and takes it. He doesn't have much else to add; hell, he probably agrees. In "Gone Quiet" (and a bit of "War Crimes"), the bubble around the administration is thick, and by the end it's popped—the White House has accepted that their way isn't always the best way, and that there's a lot they'll never know. The West Wing started as a series about an idealistic President who won under presumably idealistic terms, and the length of the show is the process of accepting the reality of the job. Because someone has to do it, and in this case, that someone is Bartlet. Lots of great Sam lines in these two: "They're worthless." "Well, they're worth one cent." "For once, I'd like there to be good news when I enter the Situation Room. Like buried treasure." "Does 105 million mean anything to you?" "I'm a simple girl."